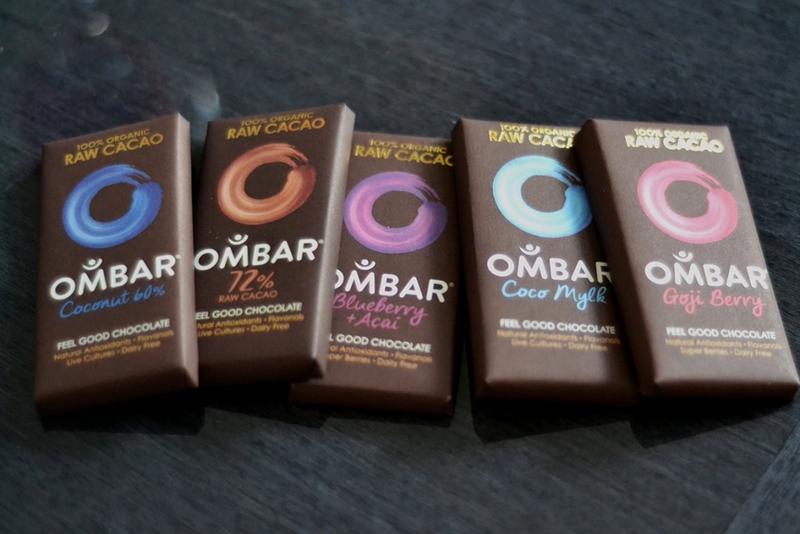 Ombar have played a key role in my journey towards vegan chocolate love. Their little bars of sweet, rich yet nutritious goodness have had me obsessed since day one, and their mantra of offering “chocolate enlightenment” to all who discover them is something I can really get on board with. Over the years, Ombar has become a staple in my sweet life, providing a welcome break from most ordinary fatty, sugary chocolate bars and proving that nutrition CAN indeed be sweet! The first thing to know about Ombar is that their chocolate is raw. Now this might seem a bit off-putting, but hear me out! Raw chocolate is never heated above 45 degrees during the creation process, meaning all of the nutrients of the cacao, such as flavanoids; copper; magnesium; calcium; zinc; iron; fibre etc. come out intact. 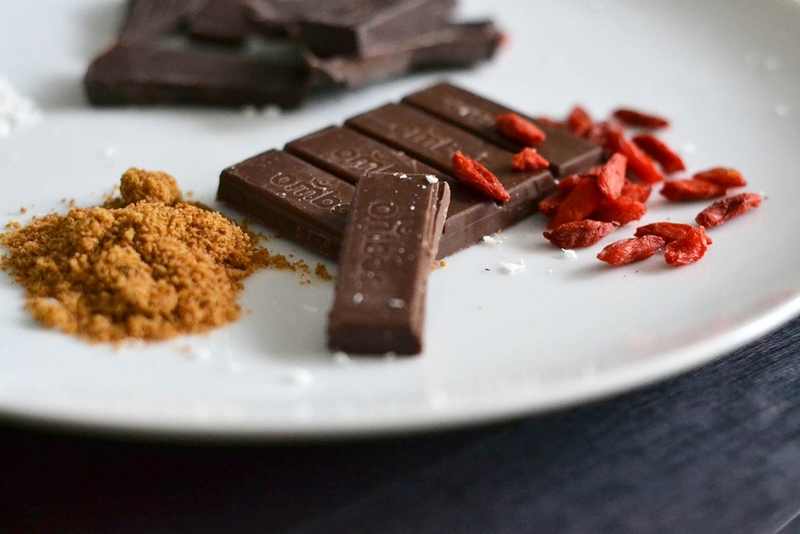 This is one of the first steps to creating chocolate that your body will love. If you’re used to eating dark chocolate like me, then you won’t think of raw chocolate as tasting much different. However, milk-chocolate lovers may need a little more persuading, so I would recommend starting with an Ombar variety that is sweetened with plenty of fruit and has a lower cocoa percentage (try 50-60%). I could go into a whole other article about raw chocolate – how it’s made; why it’s better for us and why it’s good for the planet too. Instead I’ll let Hannah Corr from The Ecologist take it away. One of the most striking things about Ombars is that they were the first raw chocolate brand to incorporate probiotics into their chocolate. Usually found in plain yoghurt or supplements, probiotics are the good bacteria we need to help keep our gut lining and digestion healthy. Thanks to Ombar’s genius idea of throwing them into chocolate, there’s now no sweeter way to get your fix. When we eat foods high in antioxidants on a regular basis, it helps rid our bodies of toxins and dangerous free radicals that can build up and cause various diseases over time, as well as lead to premature ageing. 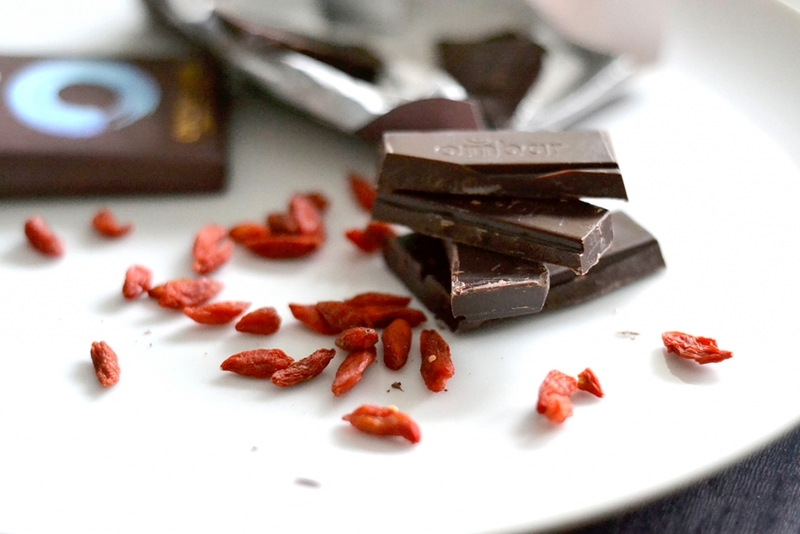 The antioxidant properties in Ombars are thanks to their pretty high cocoa content, which when combined with delicious superfood additions like goji berries, acai, blueberries and green tea, creates the most delightful treat. It’s for this reason that Ombars pack a pretty powerful nutritional punch in the treat department. I’m not saying you should eat more than one at once…but I do think it’s as good a reason aa any to enjoy a bit of chocolate! On a final note, another thing I adore about Ombars is that they are sweetened with natural coconut palm sugar. Coconut sugar comes from the sap of the cut flower buds of the coconut palm, and the sap is placed under heat until it crystallises to make sugar. I find this kind of sweetener a pleasantly healthier alternative to refined sugar, as it also contains plenty of nutrients, such as potassium, magnesium, iron, zinc and a host of B vitamins. 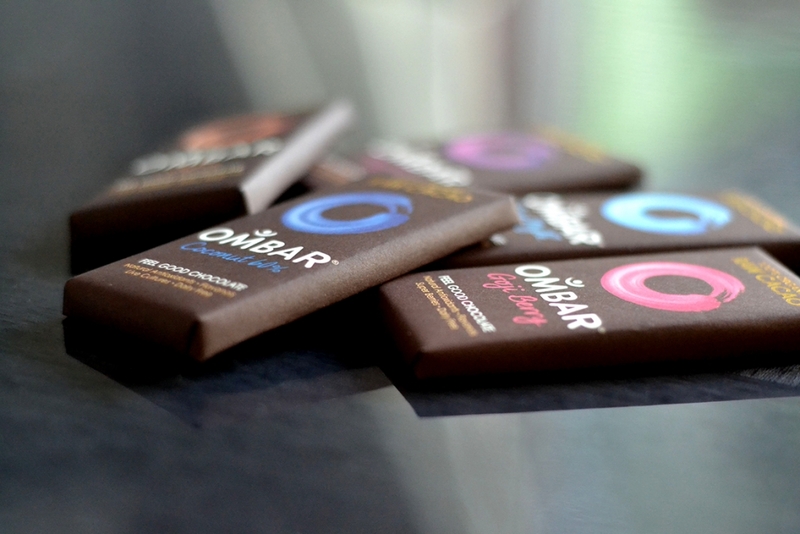 The rest of Ombars’ ingredients are refreshingly minimal for a chocolate bar – raw cacao, cacao butter, and of course the added superhero ingredients that provide us with a choice of amazing varieties. Besides plain dark and plain milk flavours, buyers can also choose from goji berry, cranberry & mandarin; lemon & green tea; coconut, and acai & blueberry. Ombars can be found in many health food stores – I get mine from an independent world foods store called Matta’s on Liverpool’s Bold Street. However, they can also be ordered online from Amazon or The Raw Chocolate Shop.